Web design and search engines optimization. Consulting and marketing for your business. Responsive design that work for mobiles, tablets and desktops. Economic: It includes from 4 to 6 informative pages as home, about us, information about your products or services, contact us. Shop online: Let you sell products online, it includes shopping cart, information products administrator, prices, categories, sub categories, statistics and other features. Portals: Information portals with administrator to update news, photos, videos. Free domain (.com,. net,. info. us, .biz or .org) and hosting for 1 year. Website optimized for search engines. Website registration on Google, Yahoo and bing. Advice via email for 3 months. Why hire our website design services? All our customers are 100% satisfied. We design websites according to your requirements, if you already have a website, we can make changes, improve or maintenace. 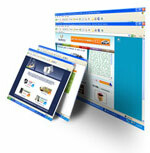 If you know nothing of web pages, we make your website and you can update without knowing of website programming. Our prices are the most competitive in the international market. We offer hight quality, professionalism and trust.